Yes, it's dreadful. Today's post is about Iran, so I am linking it. This is incredible, yet it follows a diabolical logic which I alluded to with my 'approximative Italian' in a recent comment. 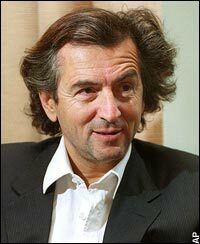 Bernard-Henri Lévy must be perfectly aware of the 'bouleversement devin' that Ahmadinejad refers to. This of course explains not only why he was 're-elected' but also why the protesters have been so brutally repressed. This is a program, and in principle the rigime are not going to allow anyone or any country to prevent them from carrying it out. God help us..
(One could surmise that the person who filmed the scene recording the whole speech was aware of the 'machiavellic plot' or whatever seems to be at stake, and made a highly dangerous personal commitment to insure that the world is made aware of it. He or she couldn't possibly have filmed this secretly). Je remercie les Talibans ici présents, ces chers qui n'agissent que pour dieu et qui mènent ce mouvement immense. Je sais à quel point ils ont payé de leur personne à Qom et ailleurs, je sais qu'ils ont empruté de l'argent, qu'ils ont mis leur vie à ce service. D'autres ont supporté d'autres difficultés. If he was referring only to 'fundamentalising' Iran, he would have had less 'need' to talk in riddles. 'The real wish that is within reach' is what? 'Conditions' are 'favourable' to what? An 'immense movement' for what? 'These are the beginnings of a great upheaval on the planet'. What upheaval, why and where? 'We haven't much time'. Why and for what purpose? We know the Iranian regime has tried through Hezbollah (as well as Hamas) to destabilise, if not worse, Israel. Logic would guide us to suspect that the Iranian regime considers it's ready to go further to 'realise its wish', whilst time allows..
Why is there no general reference to this video in the media? Tacit agreement? It can't be ignorance.